Norman Spooter is awoken in the middle of the night to discover that his eyeballs have escaped his head. They have become frustrated with his rule over them and have chosen to elope, travelling to a cult in North Dakota that will worship them for the miracles they really are. Frustrated and blind, Norman goes back to sleep, having absentmindedly stapled a ‘For Rent’ sign to the side of his now vacant head. In the morning, he finds that a group of dope-smoking, heavy-drinking, hard-partying wolves are in the process of moving their couch into his skull. With the help of the wolves and a stolen bicycle, Norman sets off to try and find his errant eyeballs. He comes face-to-face (or, rather, bicycle-to-bumper) with Zoe, a stilt-clad young woman who is on the run from her tyrannical walrus of a boyfriend. You read that right: her boyfriend is a walrus. But Zoe has problems beyond Walter the Walrus, for she too has a startling deformity that she is not eager to reveal. Party Wolves follows the classic roadtrip novel format. With car chases, escapes, and epic battles, it brings out the adventure nerd in all of us. Using an outline his uninitiated readers would recognize, Rose’s novella provides a gentle introduction to the genre he so clearly adores. The rules of the world, while obviously established, can be somewhat unclear to the audience. While readers unfamiliar with the genre can sometimes feel bogged down by the eccentricities of environment, Rose keeps the piece grounded with the use of believable characters. Despite their strangeness, Norman and Zoe are empathetic and well-developed, just trying to get by in the absurdity of their world. The Party Wolves are loveable caricatures with deeply buried insecurities beneath their carefree natures. Even Walter the Walrus appeals to the reader despite his abusive control over Zoe and natural state of, well, being a walrus. While the story itself is charming, inviting, and loads of fun, I was occasionally frustrated by the editing of the piece. Punctuation, particularly quotation marks at the beginning of paragraphs, was often forgotten, and more words than I normally see in finished editions were accidentally omitted. I hope that in future printings these oversights will be addressed as nothing so arbitrary should detract from this wonderful story. 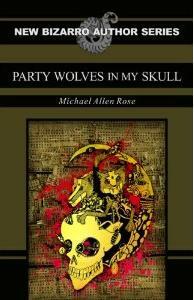 Party Wolves in My Skull is available in paperback from Amazon and Barnes and Noble for $9.95 plus shipping, and on Amazon Kindle for $4.95 if you are thusly inclined. Unfortunately, due to the still relatively unknown nature of Bizarro Fiction in general, it is only available online. However, please don’t let that deter you from ordering a copy: the purchase of this or any other book from the New Bizarro Author Series benefits the authors greatly by helping them obtain an extended contract with Eraserhead Press. If you do happen to be familiar with any independent bookstore owner, I’m sure any of the authors in this series would be delighted to have their books for sale in shops as well. The book is also listed on Ingram. I highly encourage anyone with a sense of humour to pick up a copy of this book. Or two, to share with friends. Or twenty to pass out at your next church potluck. They won’t mind. Fantastic review. Thank you so much! Cool review bro. I’ll be sure to pick this bad boy up.